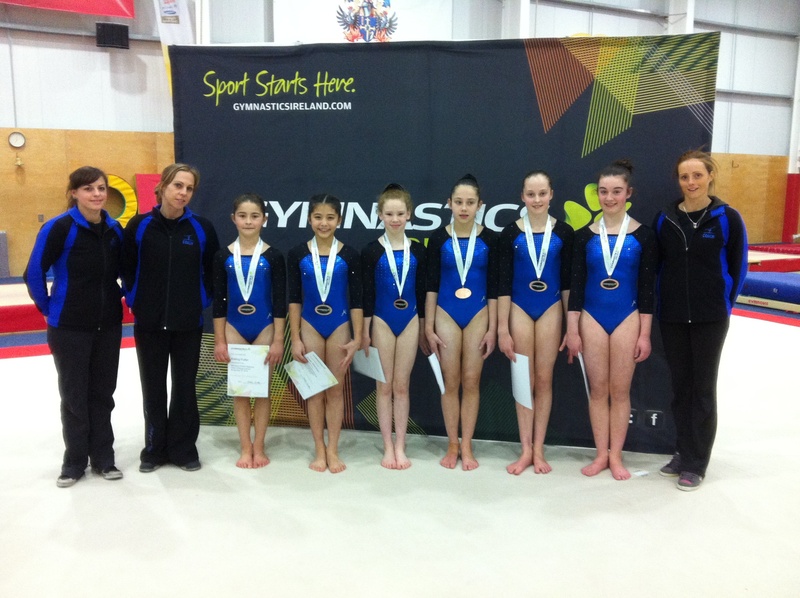 Renmore National Team win Bronze for the third year! 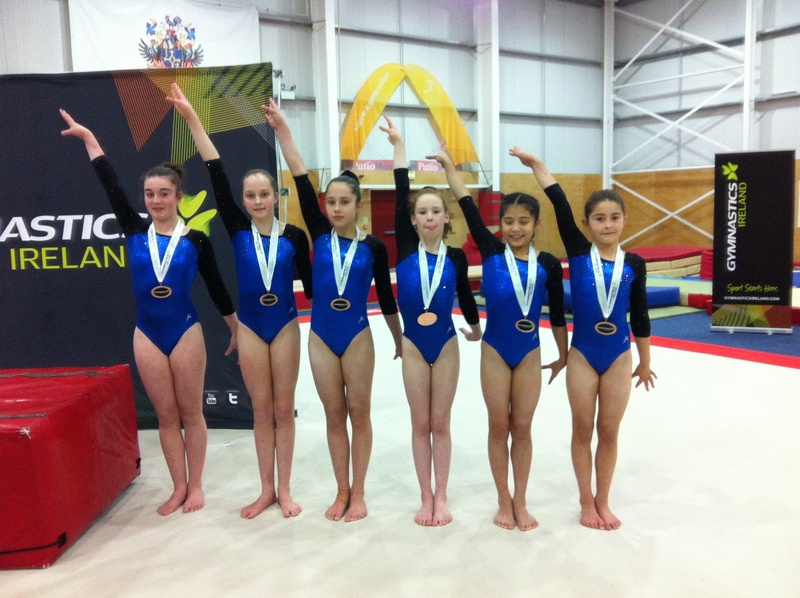 Saturday 9th November Renmore Gymnastics battled it out once again at National Team Championships and returned for the third year securing the bronze medal position. After an eventful week Emmeline Anghileri had to withdraw from the Team at the last minute due to illness and Renmore’s Alex-Marie McDonagh stepped in as 6th team mate. Once again with a young team (all Minors and Juniors), the gymnasts showed great focus and determination throughout the long day and returned home with another great result. Ellen Hynes showed great consistency and huge determination after returning from surgery this year and a recent knee dislocation!!! Ellen really demonstrates both experience and confidence and as always acts as a great captain for her team mates. She performed her routines beautifully and later in the year she will add some upgrades on all pieces. Amy O’Neill competing several new skills for the first time did great work at getting the job done! Showing beautiful artistry in her floor exercise and sticking her tsuk for the first time. Amy is beginning to prove herself as a good competitor and handled the pressure of competing so many new skills within one event. Roisin Curran opened the competition for us on floor dancing with confidence and leading the team into the competition with great energy and lovely artistry. Roisin like Ellen also brings with her some experience as she competed on Saturday in the National Championships for the 3rd year running and like Amy, Ellen and Emer only turning of Junior age next year. Roisin competed her giants for the first time along with her full twist on floor and did a great job at hitting both new skills and routines. Aisling Fuller one of our younger team members also had an outstanding day. Competing at FIG for the first time with some clean progressive routines and some great upgrades just around the corner she proved once again she is a natural competitor. Alex-Marie another very young competitor who joined the team in the final stages also had an absolutely great day. She put nerves aside and focused on hitting her skills and routines to contribute towards the team score and to prove she is both a very confident gymnasts and a great force to be reckoned with. Alex achieved a PB on beam hitting her routine and performing her full twist dismount for the first time. Emer Shimizu completes the team, another young gymnasts entering FIG for the first time, and once again performing lovely clean routines with such a great style that Emer does oh so well. She was also competing many new skills for the first time including her full twist, straight front and back tuck on beam, she did this with confidence and great flare! Overall the team battled well for the day, starting on floor and scoring the second highest team total behind Salto with almost all the girls competing new tumbles for the first time. The team then moved to the rest area and maintained good high spirits and focus as they prepared for the following rotation of vault. 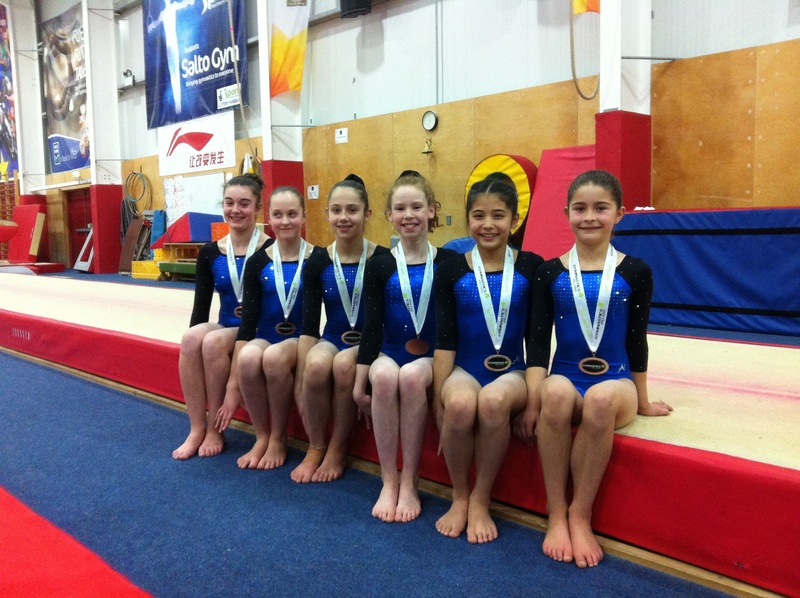 Vault went well with Amy and Ellen both performing their tsukahara vaults. Renmore, the only team to have only 2 higher scoring vaults still managed to score 36.167, only 0.034 behind Nadia GC and 0.2 behind Douglas GC, great work girls on keeping that gap close! Onto bars the team bought their great energy and performed 6 hit routines swinging both cleanly and confidently placing themselves in 3rd, 1.5 behind Nadia and looking onwards towards the beam knowing the test would come with the final rotation. Whilst the beam routines showed very good artistry and confidence some team members had to count some uncharacteristic falls and it seemed the pressure of beam on the final rotation possibly took some tolls at the end of the long day. At the final outcome the team still secured the Bronze medal position and showed they are indeed very very consistent and very present at this competition level!We are very proud of all of them and the hard work and commitment that they put into their training. 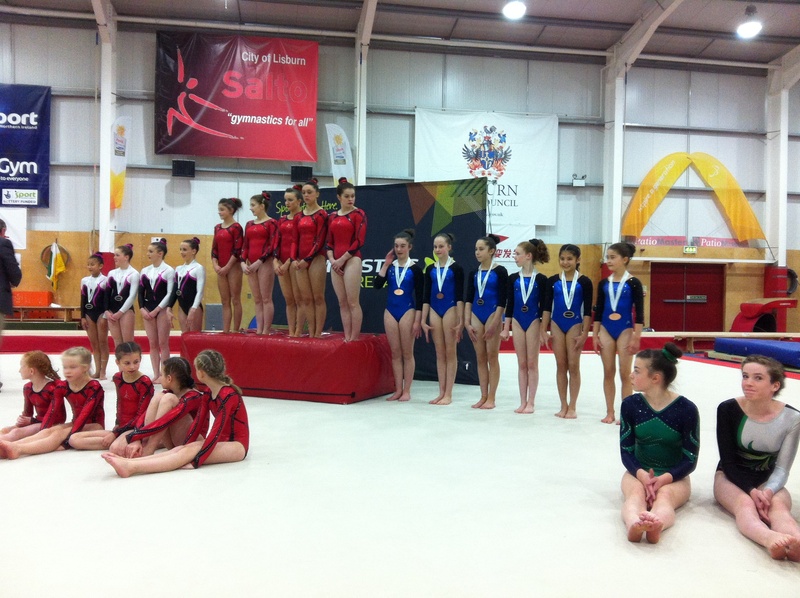 Once again girls you had achieved a great result to show for it! Next postRGC Family Fun Day – Great fun had by all!